Anyone else singing the blog post title in their heads? That little catchy tune by Calvin Harris? I'm guessing I shall be humming that for the rest of my evening then.. apologies if anyone else is now suffering. A'lright 'me loversss.. New post for you to feast your eyes upon! 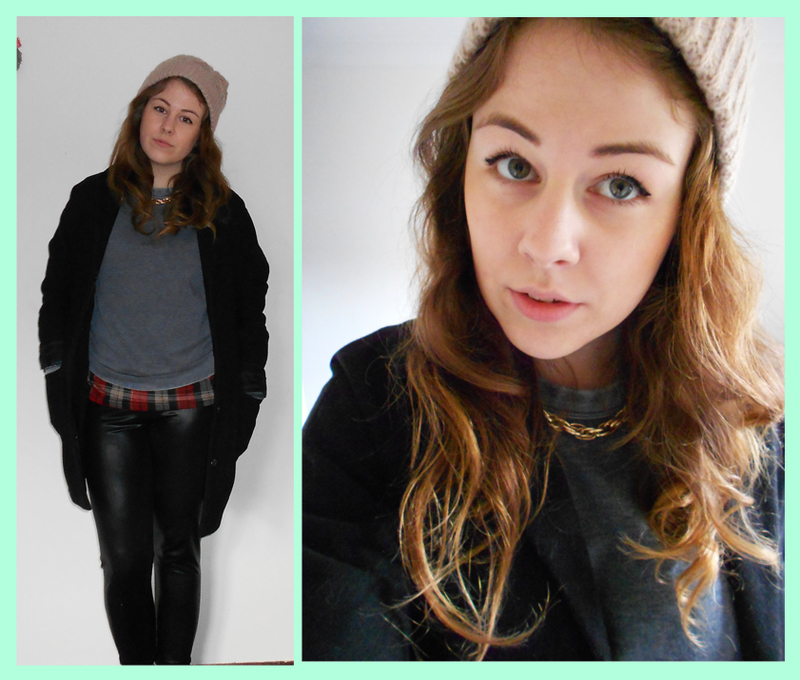 I wore a very 80's inspired outfit today, which consisted of tartan, a boyfriend coat and a lot of darker colour's. First up, was my tartan t-shirt, which I've mentioned previously from ASOS. I'm also milking my layering habit at the moment and experimenting with different prints and patterns underneath jumpers and cropped t-shirts. I'm also loving these new Jersey sweaters that Topshop have recently stocked up with as they're super lightweight (ideal for layering) as well as a perfect cropped length and burnout detailing. I've so far worn my with blouses and t-shirts underneath as they're not hot and stuffy jumpers but really lovely and lightweight to be able to wear when rushing about the place without the fear of burning up and sweating. I then of course wore my wet look leggings as I wanted to add a little grungy edge to my outfit and felt this really pushed for the 80's vibe. A gold chain necklace was then added just for a little extra something around the neckline as I felt a little bare. I finally wore my light pink beanie from.. NewLook possibly? It's pretty ancient.